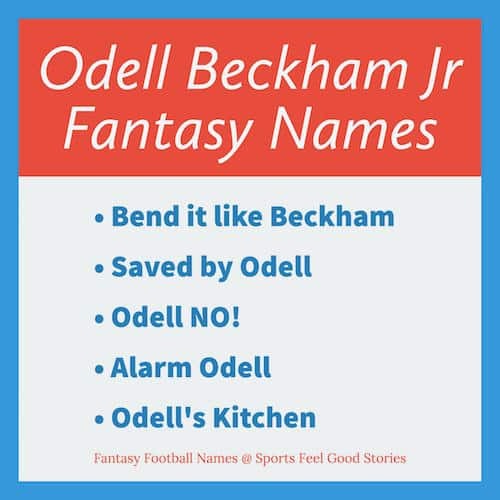 Here are some great Odell Beckham Jr Fantasy Football Names for your enjoyment. The flashy receiver stormed the NFL after making arguably the finest catch ever made in the NFL. He’ll be playing for the Browns this season. With breakaway speed and incredible hands, he always has the potential to be a game changer. More recently, he’s experienced some difficulties keeping his emotions in check when provoked. But, make no mistake about it, defenses around the league develop their schemes focused on Odell. Who doesn’t love his one-handed catches? Check out these funny Odell Beckham fantasy names. Funny Fantasy Football Team Names for Odell Beckham Jr.
Dr Beckham And Mr Hyde. The Odells will be Ringing. Hotel – Odell – Holiday Inn. Knights of the Odell Republic. What two NFL greats went to the same high school as Odell Beckham? Answer: The Manning brothers – both Peyton and Eli attended Isidore Newman High School in New Orleans, Louisiana. The other Manning bro, Cooper, and Odell share a record. As receivers, both generated over 1,000 reception yards in a season at Isidore Newman. For Whom the Odell Tolls. The Odells of St. Mary. At what age did Odell know that he wanted to play in the NFL? It’s hard to believe, but Odell told him mother at the age of four years old he would be playing professional football. His mom and dad should probably be given a little thanks as both played college sports. His dad played football (running back) and his mom ran track. This whole blue ribbon genetics thing seems to crop up a lot with professional athletes. Let’s see, his fellow high school alums the Mannings had a dad who played in the NFL for many seasons. Archie was a pretty darn good QB as well. Check out Odell Beckham Jr. on Twitter.